A rescue operation that began last week off Malta was successful in saving 158 persons on board two separate migrant boats. Six persons died. Two fell into the sea and were lost while being transferred from their boat to a passing merchant ship, the Victoria VI. Two died on board the migrant boat before the rescue. And two died after the rescue. The 68 survivors were rescued by the Victoria VI on 14 August. They were then transferred to AFM vessels and taken to Malta. 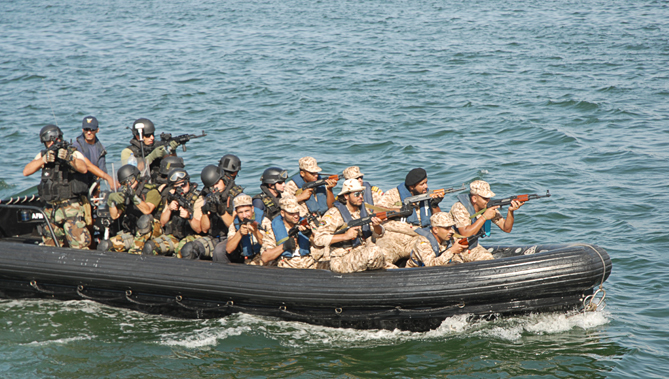 An AFM patrol boat rescued 90 other migrants from a second boat on 15 August. The migrants are reportedly from Somalia and Eritrea. A third boat carrying 77 migrants was rescued yesterday, 20 August, by the AFM. Click here for AFM press statement and here for article. Pictures below from 20 August 2012 rescue. The draft report prepared by Tineke Strik (Netherlands, SOC), “Lives lost in the Mediterranean Sea: who is responsible?”, will be considered on 29 March in a closed session by the PACE Committee on Migration, Refugees and Displaced Persons. Full text of PACE press release: “Strasbourg, 26.03.2012 – Tineke Strik (Netherlands, SOC), rapporteur for the Parliamentary Assembly of the Council of Europe (PACE) on ‘Lives lost in the Mediterranean Sea: who is responsible?’ will present her draft report at a press conference in Brussels on Thursday 29th March 2012. The report is the result of a nine-month inquiry, launched at the request of 34 Assembly members, following a March 2011 incident in which it is alleged that 63 people attempting to flee the conflict in Libya died at sea after their appeals for rescue were ignored, including by armed forces operating in the area. As part of her inquiry, Tineke Strik spoke at length with survivors, search and rescue authorities from Italy and Malta, as well as NATO and EU officials, and put detailed written questions to a number of governments, including those with vessels with aircraft-carrying facilities in the area at the time. She also obtained a reconstruction of the voyage using the science of forensic oceanography. The same day, prior to the press conference, Ms Strik will present her report to PACE’s Committee on Migration, Refugees and Displaced Persons, meeting in closed session. If approved by the committee, the report will go forward for plenary debate by the 318-member Parliamentary Assembly, probably on Tuesday 24 April during its spring session in Strasbourg. The press conference will take place at 2 p.m. on Thursday 29th March at the Council of Europe office in Brussels (Avenue des Nerviens 85 / Nerviërslaan 85, B-1040 Brussels). The rapporteur will be joined by representatives of the International Federation for Human Rights (FIDH) and Human Rights Watch. A video recording of the press conference will be made available at the link above, and on the PACE website, as soon as possible after it ends. If approved by the committee, the full text of the report will be posted on the Assembly’s website at around 2 p.m. Central European Time. Angus Macdonald, PACE Communication Division, mobile +33 (0)6 30 49 68 20. Andrew Cutting, Council of Europe Office in Brussels, mobile +32 (0)485 21 72 02. Click here for PACE Press Release of 26 March. Click here for Committee meeting agenda. Click here for HRW Press Release of 26 March. Click here (IT) for article. 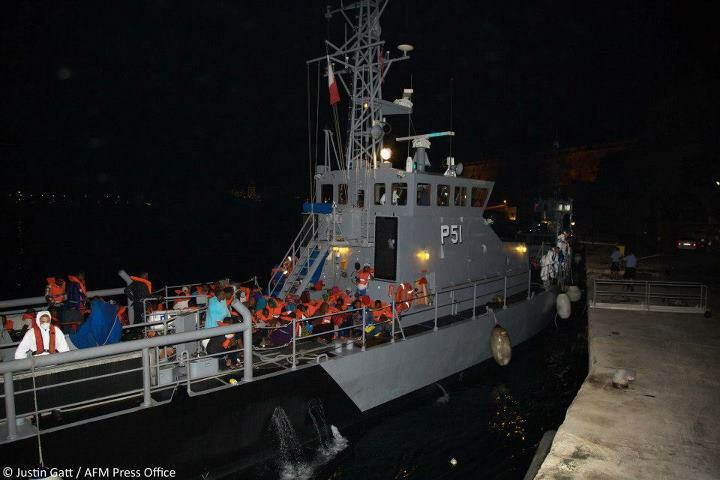 An Armed Forces of Malta patrol boat rescued 44 Somalis from a sinking 7 metre dingy early Tuesday morning. The rescue took place about 70 nautical miles south of Malta. The migrants have been taken to Malta. The boat is believed to have departed from Libya on Saturday. Survivors reported that two persons died during the voyage. Click here and here (with video) for articles. In an incident last week, the Moroccan Royal Navy rescued 53 migrants from a boat off Dar Kabdani. At least four persons are known to have died in that incident. Click here (EN) and here (IT) for articles. The Times of Malta reports that the Armed Forces of Malta (AFM) and Maltese SAR authorities have rejected what they characterised as the “impression conveyed” by a UNHCR spokesperson that “Maltese SAR authorities abdicated from their responsibilities and did not cooperate with the relevant Italian authorities” in connection with the search for and subsequent rescue of 44 migrants on board a disabled boat on 9-10 November. The migrants were rescued by the Italian Navy ship Foscari and transported to Sicily, not to Lampedusa or Malta which were the two closest ports. Click here (EN), here (FR), and here (ES) for articles. The stand-off between Malta, Spain, and NATO continues. 111 rescued migrants remain on board the Spanish Navy frigate, the Almirante Juan de Borbón. Maltese authorities criticised the attempt to bring the rescued migrants to Malta and have said that the migrants should have been taken to Tunisia or Italy because both locations were closer to the original point of rescue. Malta has now allowed a total of 5 migrants to be airlifted to Malta for medical care. The frigate remains at sea near Malta with the 111 migrants, including women and children, and a crew of 250 sailors. It is unclear from various media reports whether Italian authorities formally refused permission to the Spanish frigate to dock in Lampedusa, but some reports suggest there was communication with Italian authorities who said that Lampedusa’s immigrant reception facilities were at capacity. Well over a thousand migrants have landed in Lampedusa in recent days. There are also some media reports which suggest that the Spanish government may be taking the position that since the Spanish frigate is under NATO command as part of Operation Unified Protector, NATO therefore must decide where the migrants are to be disembarked. The head of the Armed Forces of Malta has taken the bizarre position that the Spanish ship is well-equipped to care for the rescued migrants and that therefore there is no urgency in regard to removing the migrants from the ship for humanitarian reasons. Meanwhile, the NATO naval embargo of Libya is missing one ship. NATO had 17 ships under its command patrolling the Central Mediterranean, now there are 16 ships. The Spanish frigate has been effectively removed from its embargo duties as it waits for a resolution to the stand-off. If and when another migrant boat requires rescue by a ship under NATO command, will the NATO embargo be further weakened? The obligations of NATO ships to rescue migrant boats in distress under SOLAS are clear, and NATO has repeatedly said that it will rescue migrant boats when required, but one must be fearful of a situation arising, as it does with commercial ships, where a NATO vessel’s commander may be less willing to conclude that a migrant boat is in need of rescue knowing that the act of rescuing the migrants may result in the NATO ship being removed from its mission because it is unable to quickly disembark the rescued migrants. Click here (EN), here (EN), here (ES), here (IT), and here (IT) for articles. Brigadier Martin Xuereb, the head of the Armed Forces of Malta (AFM), spoke at a recent seminar sponsored by the European Parliament, “Europe’s new Mediterranean reality: Migration and asylum in Malta, Greece and Cyprus,” and summarised Malta’s interpretation of its search and rescue obligations. Xuereb said that Malta is obligated to coordinate search and rescue operations within its SAR zone, but is not required to perform all rescue operations. Xuereb said Malta believes rescued persons should be disembarked at the nearest place of safety which, given the size and location of the Maltese SAR, will sometimes mean that Italian territory, particularly Lampedusa, is closer. Xuereb acknowledged that this interpretation is not shared by others. Xuereb “said that Malta had consistently insisted that the arrangement that best represented the interests of rescued persons was one that saw them disembarked in the nearest place of safety.” He said the Maltese Rescue Coordination Centre (RCC) has coordinated or assisted with 54 SAR cases so far this year. Xuereb also confirmed that Malta would continue its refusal to host Frontex joint operations because of its objections to Frontex guidelines which are based “on a number of grounds, including the fact that [the guidelines] addressed matters deemed to be outside community competence and attempted to erode the rights that Malta enjoyed under the international legal framework. 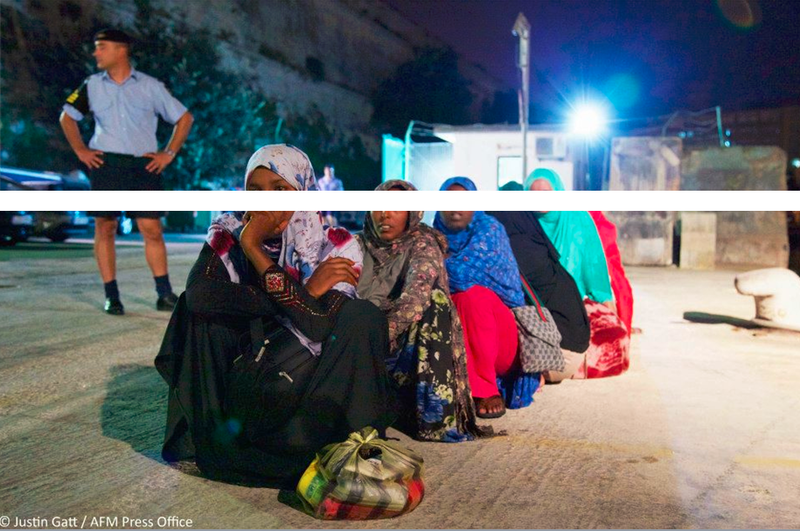 … In light of these guidelines, Malta considered the hosting of [Frontex] joint operations to be detrimental to its national interest.” Malta objects to the guidelines because it believes they would require rescued migrants to be disembarked in the country hosting the joint operation. An article by Silja Klepp (Research Associate, Research Center for Sustainability Studies (artec), University of Bremen) entitled “A Double Bind: Malta and the Rescue of Unwanted Migrants at Sea, a Legal Anthropological Perspective on the Humanitarian Law of the Sea” has been published as an online advance access article by the International Journal of Refugee Law. Abstract: “This paper discusses research results from anthropological fieldwork carried out in Malta in 2007. The island, which is situated in the central Mediterranean Sea between Tunisia, Libya and Italy, is a focal point regarding the continuing refugee situation. One of the research aims was to investigate the situation at sea concerning Search and Rescue (SAR) operations for migrants and refugees crossing the Mediterranean by boat. In the year 2006, 556 missing and drowned migrants were registered in the central Mediterranean between Libya, Malta and Italy, this number increased to 642 in 2008.1 The goal of the research in Malta was therefore to understand why an increasing number of migrants were dying at sea and what role the European security forces play in this context. Migrant boats carrying over 2500 persons arrived in Lampedusa over the weekend. The boats are all believed to have departed from Libya. Improving sea conditions are thought to be responsible for the new surge in migrant boats. Italy has said it will lodge a formal diplomatic complaint with Malta over what it says was Malta’s failure to rescue a migrant boat in distress. The migrant boat in question was apparently closer to Lampedusa than to Malta, but was within the Maltese SAR zone when a distress call was made. Maltese authorities said they were unable to send their patrol boats to the boat that was in distress due to bad sea conditions. Italian coast guard boats eventually provided assistance while NATO and Armed Forces of Malta aircraft provided air surveillance. Click here (IT), here (EN), here (EN) and here (EN) for articles.